Background: In the present times, arsenic poisoning contamination in the ground water has caused lots of health-related problems in the village population residing in middle Gangetic plain. In Bihar, about 16 districts have been reported to be affected with arsenic poisoning. For the ground water and health assessment, Simri village of Buxar district was undertaken which is a flood plain region of river Ganga. Methods: In this study, 322 water samples were collected for arsenic estimation, and their results were analyzed. Furthermore, the correlation between arsenic contamination in ground water with depth and its distance from river Ganga were analyzed. Results are presented as mean ± standard deviation and total variation present in a set of data was analyzed through one-way analysis of variance. The difference among mean values has been analyzed by applying Dunnett's test. The criterion for statistical significance was set at P < 0.05. Results: This study shows novel findings ever done in this area. 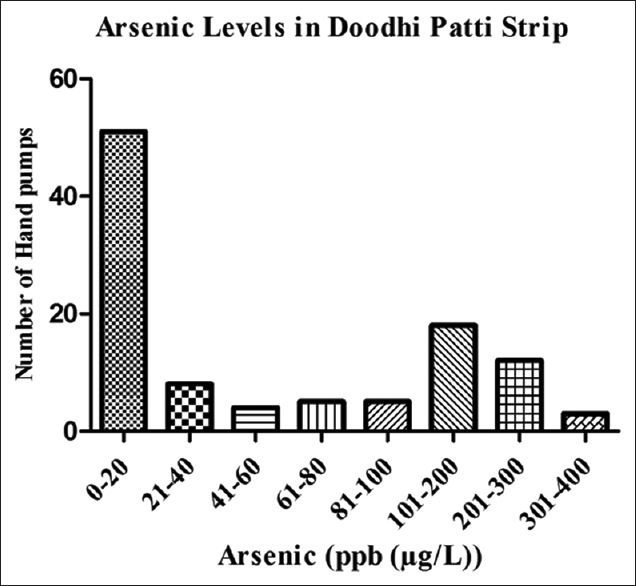 Halwa Patti and Doodhi Patti strips were the most affected strips with high-arsenic concentration in hand pumps. Furthermore, a correlation between the arsenic concentration with the depth of the hand pumps and the distance from the river Ganga was also a significant study. Conclusions: The present study concludes that in Simri village there is high contamination of arsenic in ground water in all the strips. Such a huge population is at very high risk leading the village on the verge of causing health hazards among them. Therefore, an immediate strategy is required to combat the present problem. In India, arsenic contamination in ground water is very severe in West Bengal, and now it has reached the Gangetic plain regions of Bihar and Uttar Pradesh. The most unfortunate part is that the village people of these arsenic hit area are unaware of arsenic contamination in their drinking water and are unknowingly consuming this water without aware of its facts as well as its consequences. 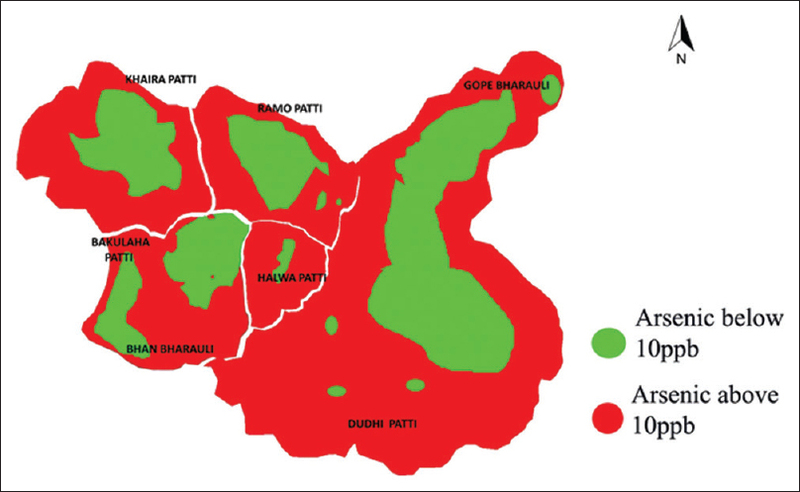 In Bihar, the demographic assessment of arsenic in ground water is a meager reporting. This prompted us to evaluate the arsenic concentrations in the ground water of Simri village of Buxar district of Bihar, which is one of the arsenic hit areas of the state. The study was conducted in India in Simri village of Buxar district of Bihar. The village is a flood plain region (25°38'17.6"N 84°06'49.4"E) of Simri Block of Buxar district. The population of the Simri village is 17,670 in 2011. There are 2621 households in 2011. The village is so large in area that it is divided into seven strips - Bakulaha Patti, Bhan Bharauli, Khaira Patti, Ramo Patti, Halwa Patti, Doodhi Patti, and Gope Bharauli. 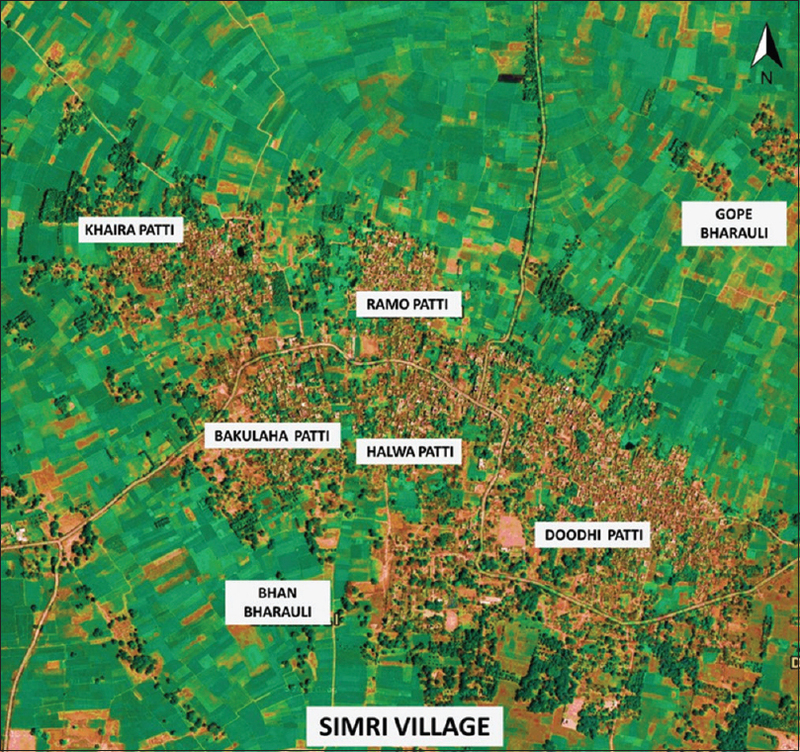 Among these seven strips, Doodhi Patti strip acquires the largest part of the Simri village. For the collection of water samples, 500 ml polypropylene bottles were utilized and were cleaned and pretreated with hydrochloric acid. Altogether, 322 water samples in duplicates were collected from hand pumps of the households every 50 m of distance in each strip of the Simri village. After the collection, water samples were on spot analyzed utilizing Merckoquant Arsenic Field test kit (Merck, Germany). Final confirmation was done using Thermo Fisher ultraviolet-visible spectrophotometer through the silver diethyldithiocarbamate method against a blank at 520 nm. For the estimation of the per capita consumption of drinking water through hand pumps by the village people, a survey in all the seven strips of the village was conducted utilizing a questionnaire method. The questionnaire was filled after proper interrogation with elderly, adults, and youths of the village (2680 people) related to the amount of daily consumption of drinking from their hand pumps, their household hand pump depth, and their health-related problems. Handheld global positioning system receivers with an estimated accuracy of ≈10 m were utilized for the determining the exact location of the area. The correlation between arsenic contamination in ground water with depth and its distance from river Ganga were also analyzed. Statistical analysis was done utilizing statistical software (GraphPad Prism 5), and the values were expressed as mean ± standard error of mean. The difference between the groups were analyzed statistically by one-way analysis of variance using Dunnett's test. The Simri village is situated near the vicinity of the river Ganga. The nearest point from Simri village that is Khaira Patti strip to the river Ganga is hardly 1.65 km. The study also emphasizes that longer the distance from the river, the higher is the arsenic concentration in the ground waters of hand pumps [Table 1]. High prevalence of arsenic contamination in ground water was found after analysis of 322 water samples [Figure 1]. 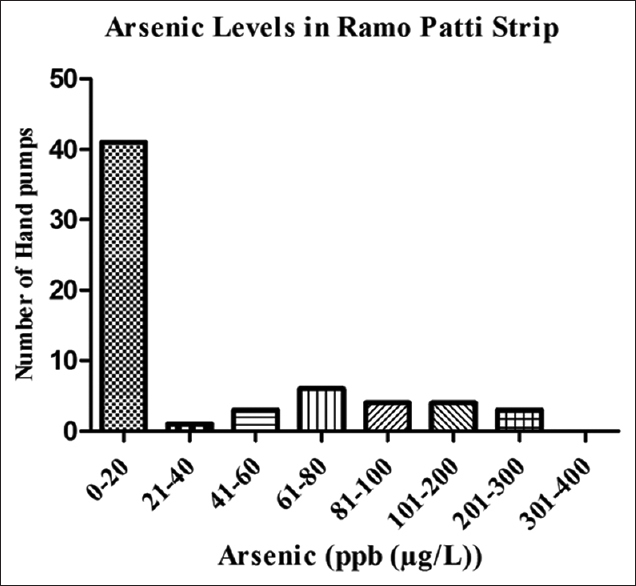 The different strips showed different patterns of arsenic contamination in ground water. 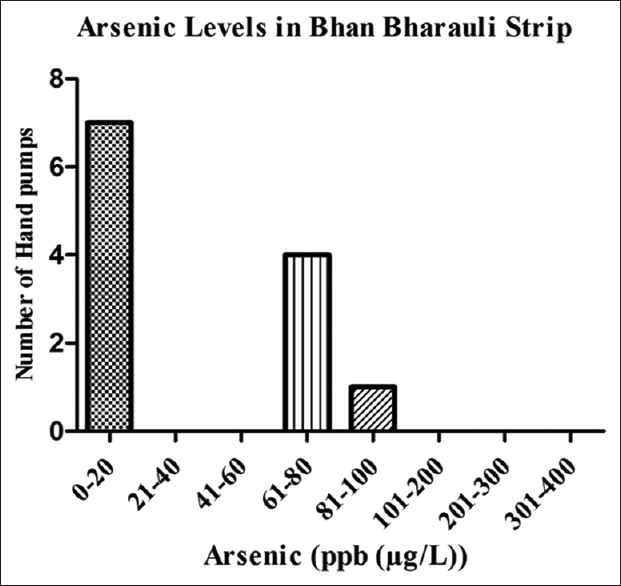 All the seven strips showed a unique pattern of arsenic contamination in the groundwater as the middle region of the strips were arsenic free, but their periphery showed severe arsenic contamination in the hand pumps [Figure 2]. 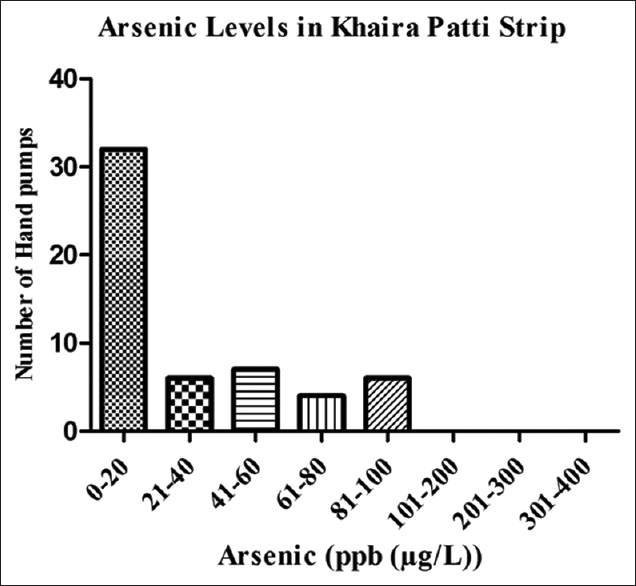 Among the most severely affected strips were Halwa Patti and Doodhi Patti where the arsenic contamination was much higher in most of the analyzed water samples [Figure 3] [Figure 4] [Figure 5] [Figure 6] [Figure 7] [Figure 8] [Figure 9] [Figure 10]. 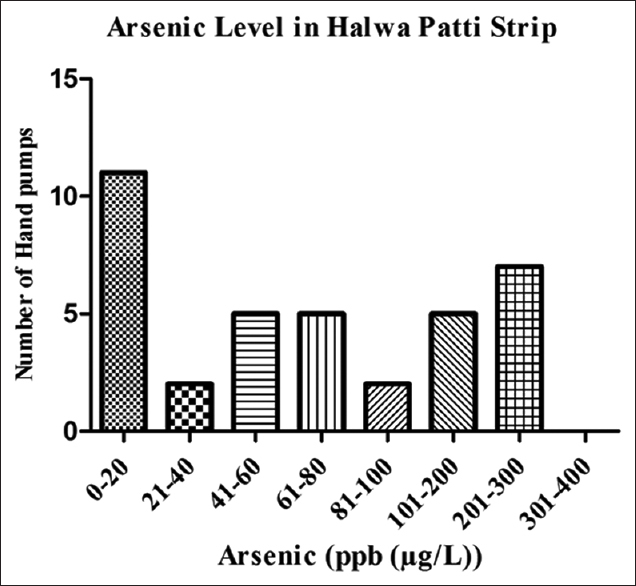 The Halwa Patti strip showed hand pumps with arsenic contamination between 60 ppb and 300 ppb while Doodhi Patti strip showed hand pumps with arsenic contamination between 60 ppb and 400 ppb. The average depth of the hand pumps in all the strips were 80 feet (24.38 m) [Figure 11]. 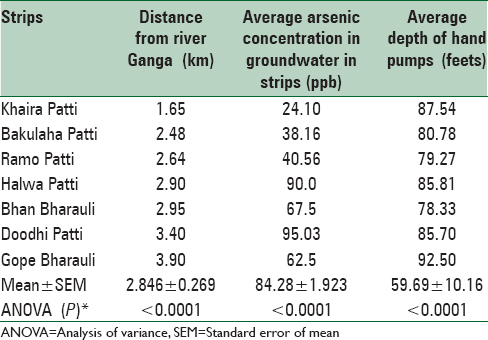 The correlation between arsenic contamination in ground water with depth and its distance from river Ganga were analyzed which was found to be highly significant [Table 1]. The groundwater arsenic contamination has been well studied in the villages of Ganga Delta of West Bengal and Bangladesh. ,,, In Bihar, the similar trend in the ground water was firstly reported in 2002 in Bhojpur district  and then after, the number has increased to 16 districts. The most of the arsenic affected districts are from the Gangetic plain area denotes again the onset of similar pattern in Bihar also. The depth of the hand pumps of the village showed no arsenic concentration up to 60 feet but below that depth between 70 feet and 300 feet high-arsenic concentration was observed. The most affected strips were Halwa Patti and Doodhi Patti strips with high-arsenic concentration in hand pumps. 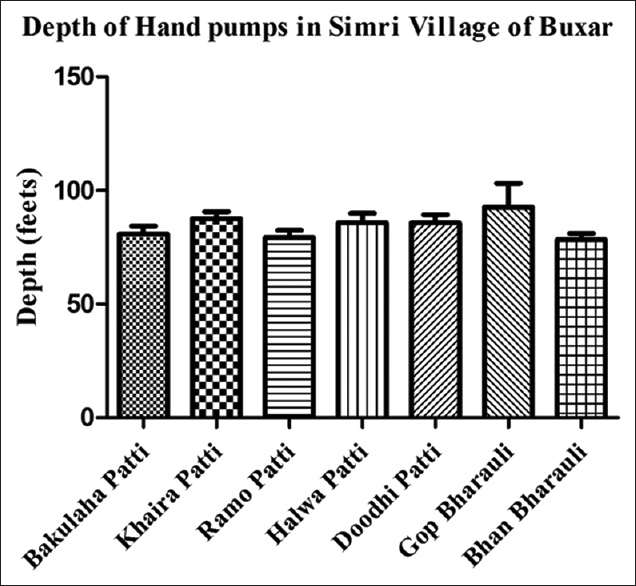 The present research work on arsenic concentration pattern in hand pumps in the Simri village is the exclusive novel study ever reported. 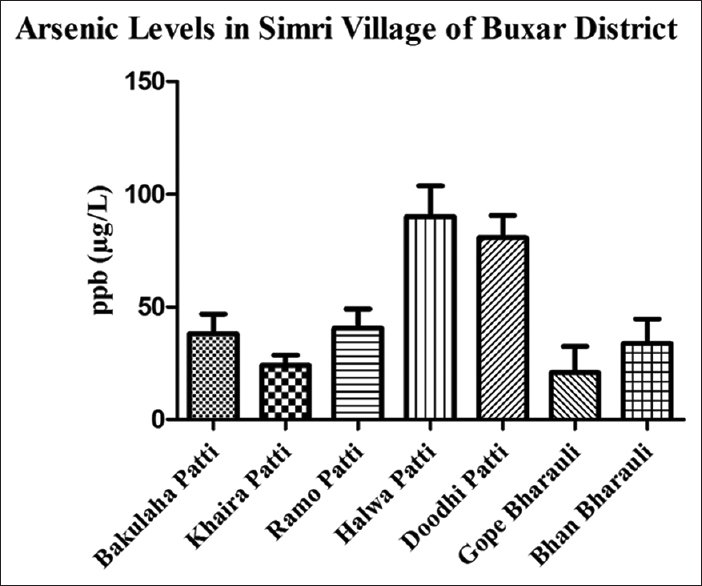 Thus, present study concludes that the village people of Simri village are at very high risk as they are consuming drinking water having high-arsenic concentration in their hand pumps. This has led to severe health-related problems in the population of the village people. Therefore, an immediate proper strategy is required to cater the health-related problems in the population of the Simri village caused by arsenic poisoning. The authors are thankful to the Department of Science and Technology, (SSTP Division) Ministry of Science and Technology, Government of India, New Delhi for the grant of this research work and to the institute for providing infrastructural facilities. Department of Science and Technology, TDT-SSTP Division, New Delhi, India (Government of India). Research Project No. DST/SSTP/Bihar/155/2011 (G). Park K. Park′s Textbook of Preventive and Social Medicine. 16 th ed. Jabalpur, India: B D Bhanot Publishers; 2001. p. 483-97. Antman KH. Introduction: The history of arsenic trioxide in cancer therapy. Oncologist 2001;6 Suppl 2:1-2. Haque R, Mazumder DN, Samanta S, Ghosh N, Kalman D, Smith MM, et al. Arsenic in drinking water and skin lesions: Dose-response data from West Bengal, India. Epidemiology 2003;14:174-82. Acharyya SK, Chakraborty P, Lahiri S, Raymahashay BC, Guha S, Bhowmik A. Arsenic poisoning in the Ganges delta. Nature 1999;401:545. UNICEF Plan of Action to Combat Situation Arising Out of Arsenic Contamination in Drinking Water: Plan to Assist Government of West Bengal Report. United Nations Children′s Fund; December, 1998. Singh SK, Ghosh AK, Kumar A, Kislay K, Kumar C, Tiwari RR, et al. Groundwater arsenic contamination and associated health risks in Bihar, India. Int J Environ Res 2014;8:49-60. Ghosh AK, Shatrunjay KS, Bose N, Sushant KS, Singh A, Mishra RC, et al. Study of Arsenic Contamination in Ground Water of Bihar (India) along the River Ganges: International Workshop on Arsenic Sourcing and Mobilization in Holocene Deltas. Department of Science and Technology, Government of India, on; 12-13 December, 2007. p. 83-7. Ghosh AK, Singh SK, Bose N, Singh K. Arsenic hot spots detected in the state of Bihar (India) a serious health hazards for estimated human population of 5.5 Lakh. In: Ramanathan AL, Bhattacharya P, Keshari AK, Bundschuh J, Chandrashekharam D, editors. Assessment of Ground Water Resources and Management. New Delhi: I. K. International Publishing House Pvt. Ltd.; 2009. p. 62-70. Saha D. Arsenic groundwater contamination in parts of middle Ganga plain, Bihar. Curr Sci 2009;97:753-5. Chakraborti D, Basu GK, Biswas BK, Chowdhury UK, Rahman MM, Paul K, et al. Characterization of arsenic bearing sediments in Gangetic delta of West Bengal-India. In: Chappell WR, Abernathy CO, Calderon RL, editors. Arsenic Exposure and Health Effects. New York: Elsevier Science; 2001. p. 27-52. Ahamed S, Kumar Sengupta M, Mukherjee A, Amir Hossain M, Das B, Nayak B, et al. Arsenic groundwater contamination and its health effects in the state of Uttar Pradesh (UP) in upper and middle Ganga plain, India: A severe danger. Sci Total Environ 2006;370:310-22. ATSDR US Agency for Toxic Substances and Diseases Registry. 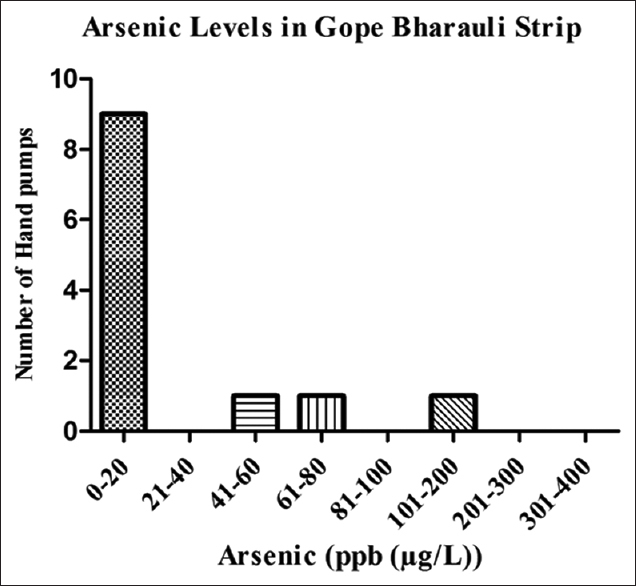 Toxicological Profile for Arsenic; 2005. ATSDR/DTEM Agency for Toxic Substances and Disease Registry, Division of Toxicology and Environmental Medicine. ToxFAQs: CABSTM/Chemical Agent Briefing Sheet Arsenic; 2006. Karim M. Arsenic in groundwater and health problems in Bangladesh. Water Resour 2000;34:304-10. Bagla P, Kaiser J. India′s spreading health crisis draws global arsenic experts. Science 1996;274:174-5. Census: Interim Report of Population Census of India; 2011. Available from: http://www.censusindia.gov.in . Nickson R, Sengupta C, Mitra P, Dave SN, Banerjee AK, Bhattacharya A, et al. Current knowledge on the distribution of arsenic in groundwater in five states of India. J Environ Sci Health A Tox Hazard Subst Environ Eng 2007;42:1707-18. Chakraborti D, Rahman MM, Paul K, Chowdhury UK, Sengupta MK, Lodh D, et al. Arsenic calamity in the Indian subcontinent what lessons have been learned? Talanta 2002;58:3-22. Chakraborty AK, Saha KC. 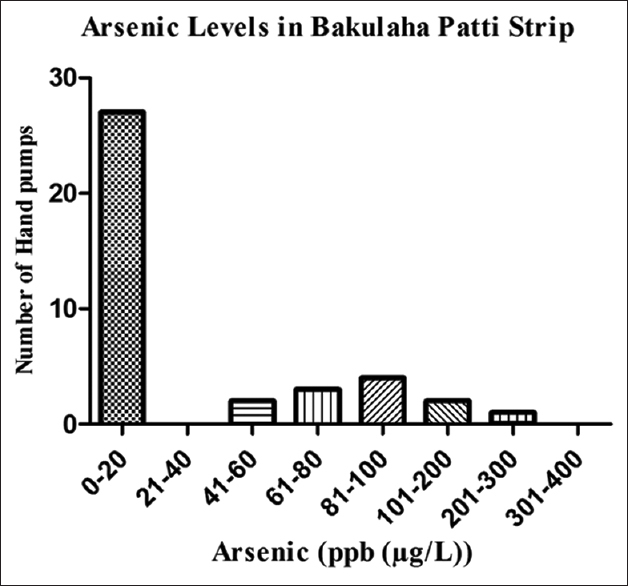 Arsenical dermatosis from tubewell water in West Bengal. Indian J Med Res 1987;85:326-34. Garai R, Chakraborty AK, Dey SB, Saha KC. Chronic arsenic poisoning from tube-well water. J Indian Med Assoc 1984;82:34-5. Chakraborti D, Mukherjee SC, Pati S, Sengupta MK, Rahman MM, Chowdhury UK, et al. Arsenic groundwater contamination in middle Ganga plain, Bihar, India: A future danger? Environ Health Perspect 2003;111:1194-201. Chowdhury TR, Basu GK, Mandal BK, Biswas BK, Samanta G, Chowdhury UK, et al. Arsenic poisoning in the Ganges delta. Nature 1999;401:545-6. Das D, Samanta G, Mandal BK, Roy Chowdhury T, Chanda CR, Chowdhury PP, et al. Arsenic in groundwater in six districts of West Bengal, India. Environ Geochem Health 1996;18:5-15. Donselaar ME, Bhatt AG, Bose N, Bruining J, Ghosh AK. Entrapment of Arsenic-Contaminated Groundwater in Point Bars: Case Study of Holocene Ganges River deposits, Bihar, India, Proceedings of 10 th International Conference on Fluvial Sedimentology, University of Leeds, UK; 14-19 July, 2013.